Saxun's bioclimatic pergolas team up with natural light in order to create new spaces, which are perfectly illuminated and protected. Saxun's pergolas are the perfect solution for all kinds of projects in the HORECA sector, either in hotels, restaurants or cafés. Gardens and terraces are an essential part of our houses. 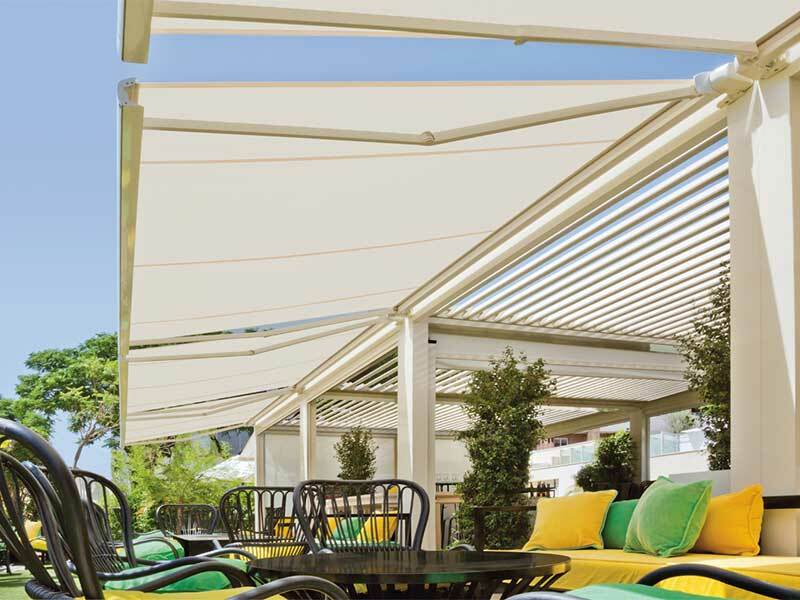 Our bioclimatic pergolas allow comfort and well-being across the whole setup, connecting them and making them bigger. 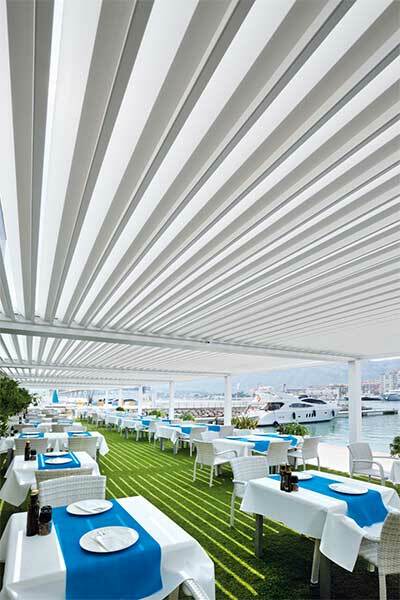 Bioclimatic pergolas by Saxun allow you to enjoy life outside all year round. They offer a variety of possibilities so that you can enjoy your terrace or garden as if they were another room in your home. They regulate the temperature of the room in a natural way, while protecting it from solar radiation, rain, wind or snow. 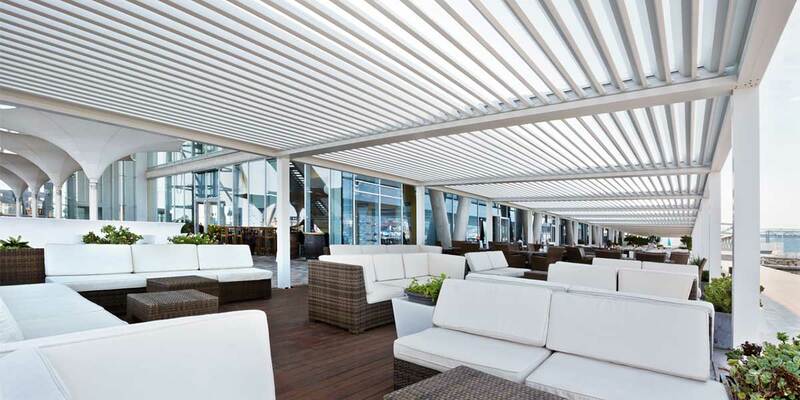 Pergolas are the best solution to increase the living area of all kinds of hotels and restaurants. And all of that without the need for construction work. Because when it comes to enjoying life outdoors, with Saxun it's possible. 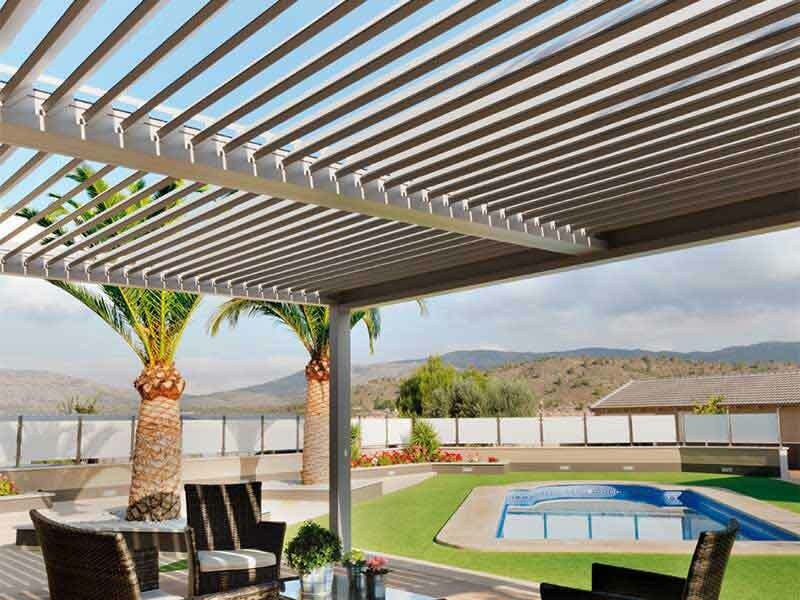 Why choose Saxun bioclimatic pergolas? 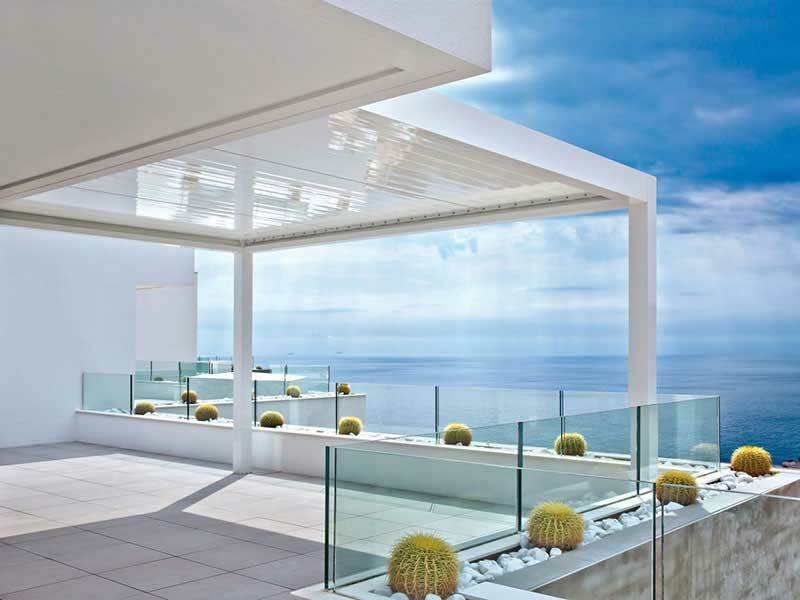 Our pergolas offer a modern and timeless design, with minimalist lines, which fits perfectly with every architectural style. The ideal solution for terraces or gardens in homes, hotels and restaurants. Bioclimatic pergolas with which you can create new environments that will promote your freedom and privacy. 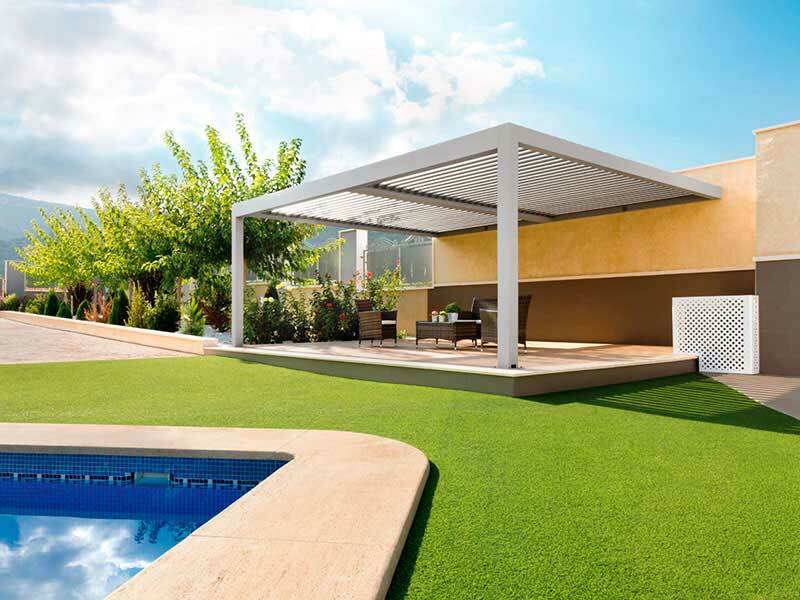 Solar protection systems that will allow you to enjoy life outdoors at any time of the year, with the quality assurance that a brand like Giménez Ganga can grant. They manage and save energy, since they regulate the temperature of the room in a natural manner. At the same time, they will protect it from solar radiation, rain, wind or any other natural elements. Saxun gives you the chance to increase the living area of your home or business without the need for construction work, since our pergolas are supported by their own structures. They have different types of mounting, as well as modulation options. In this way, a customised solution can be created for each project, allowing them to adopt different shapes and sizes that can adapt the different structures. The broad range of colours and finishes we offer you, together with the many accessories and products by Saxun that can be installed, allow a high degree of customisation. It is the best way to adapt to the different aesthetic and functional requirements that are needed nowadays. Doy mi consentimiento para que Gimenez Ganga SLU conserve y utilice los datos que he proporcionado para recibir los boletines informativos y newsletter conforme a la declaración de protección de datos, tratamos los datos de carácter personal que nos facilitas con el fin de gestionar el envío de información y la prospección comercial. Al marcar la casilla de verificación nos estás dando tu legítimo consentimiento. Los datos no se cederán a terceros salvo en los casos en que exista una obligación legal. Tienes derecho a acceder a tus datos personales, rectificar los datos inexactos o solicitar su supresión. Deseo recibir por correo electrónico un boletín con información sobre los productos, eventos y campañas promocionales de Gimenez Ganga SLU. Este consentimiento podrá revocarse en cualquier momento solicitando por escrito o por correo electrónico a través de lopd@gimenezganga.com.